Tiffany & Co. 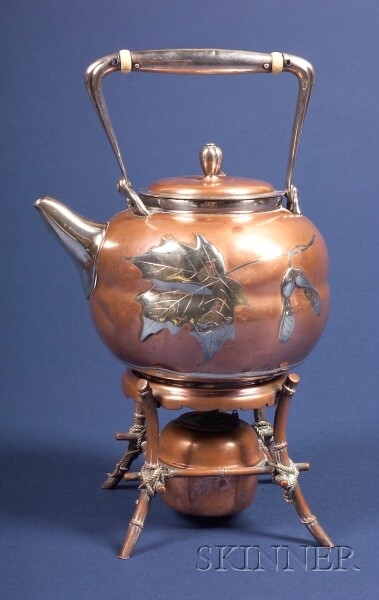 Aesthetic Movement Copper and Sterling Teapot with Associated Stand, the pot 1873-91, ovoid copper body with concave girdle, with naturalistic sterling base, short spout, and upright handle, body applied with sterling maple leaves and seed pods, lid and spout with beetles, ht. 7, together with associated Gorham copper stand, modeled as faux bamboo legs wrapped in rope, surrounding burner, ht. 3 1/2 in.